So I needed to put a sympathy card together for my uncle. I am not a fan of making sympathy cards, but I know how much a card means to someone that lost someone. Never mind a homemade one. They say it is a hug that you can send and I truly believe that. I felt the love many times over with each card that was mailed and sent to me. The leaf circle was made with Distress Oxide ink, Cracked Pistachio and Lucky Clover and sprinkle of water. I just love the leaf in the Crazy for you stamp set. I can't tell you how many times I have used it. The leaf was heat embossed. 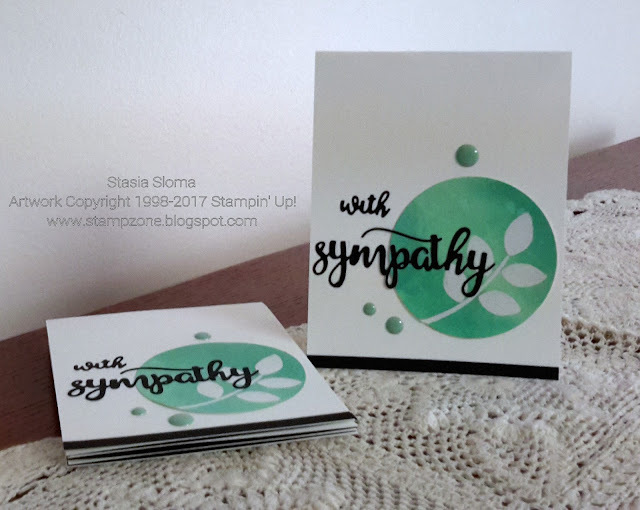 The sentiment was die cut with my Avery Elle thinlit. Enamel dots and strip of card stock complete the card.